Bodaboda Baby: I can sit. Don't touch me, don't pull me. A message to all bodas. I can sit. Don't touch me, don't pull me. A message to all bodas. Should have stuck to this guy. One of my regular drivers, John, looking cool in red. Ironically, the day I went down on a boda on the mud I was listening to a song on my iPhone with lyrics that say "Steady and Straight/ And if they drag you through the mud/ It doesn't change what's in your blood/ Over rock and chain over sunset plain/ When they knock you down/ Don't break character/ You've got a lot of heart." I wasn't going over rock and chain and sadly, not sunset plain, rather just a wet dusty dirt road near my house, on the way to the East Africa Agriculture Value Chain Investment Summit to hear representatives from the The Presidential initiative for Banana Industrial Development (PIBID) speak, among others. It was Tuesday morning this week, about 8.20, and I was on my way to Speke Resort and Conference Centre at Munyonyo. Ironically, a friend had offered to pick me up on the way but I'd said no. It was the one day when none of the bodas at my regular stage - Julius, Ronnie, David (my favorite), John, Frank and Vincent to name most of them - were around, so I was forced to yell out and hail another driver. I was wearing a leopard print dress which was creeping up around my knees (Whistles, if anyone cares) to try and impress the banana brigade (word also had it that President M7 might also grace the conference with his presence). As a result I got on the boda and sat side saddle. Now I'm the first to say I'm not that co-ordinated (yes, really), but I have sitting side saddle on a boda in a short frock under control. The random boda driver however apparently doubted my skills as I'd been on the vehicle only about a minute when he pulled at my dress, gesturing for me to move my bum towards the front of the bike, obviously so I wouldn't fall off. Guess what happened? I fell off, head first onto the mud. Thank god it wasn't a dirt road, as I would have hurt myself. My iPhone actually sustained the most damage, the screen cracked. The Apple retailer in town will be happy, I thought. I was already their best customer. Although the boda driver was only looking out for me and apologized profusely - "Sorry madame, sorry" - I silently cursed him for the rest of the 15 minute trip. I was also mad at myself. This is what happens when you cheat on your regular regular boys, I thought. I arrived at the conference late and in a bit of a fluster, with mud down my legs. I was in no state to meet the president, so was glad when I was told he wouldn't be making an appearance after all as apparently it was his birthday. Technically speaking though, I still hadn't had a proper boda accident as the driver had pulled me off the bike. And just to recap, the other times I sustained injuries where a boda was involved was the time I fell getting onto a bike, pulling another mzungu on top of me on the side of the road (much to the amusement of the driver, who didn't know where to look, and the Ugandans laughing at us as they drove and walked past). 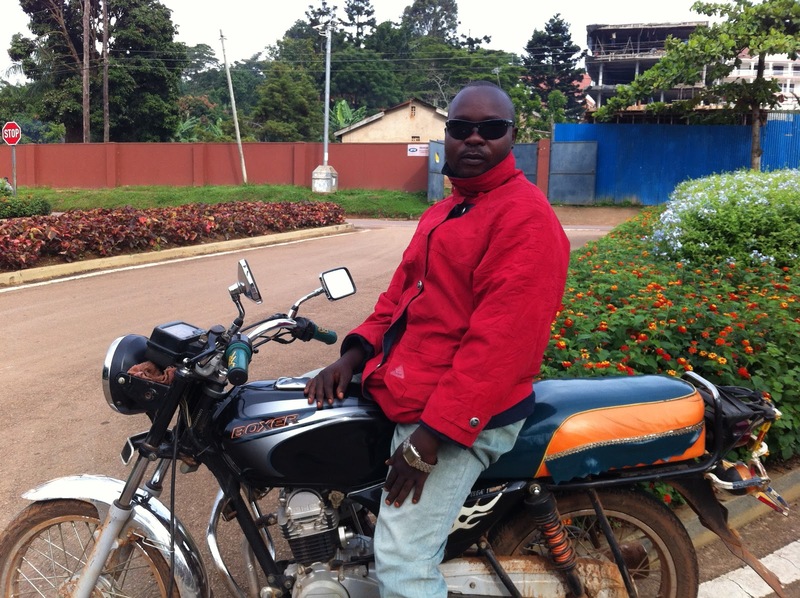 The other time was when a boda ran into me, while I was walking. So they weren't boda accidents either, technically speaking. To any boda driver who happens to be reading this, I'd just like to let you know I CAN SIT. I know how to sit. In fact I'm quite good at it believe it or not. Even when I'm wearing a dress. Even when I'm riding side saddle. So don't pull me, don't touch me. 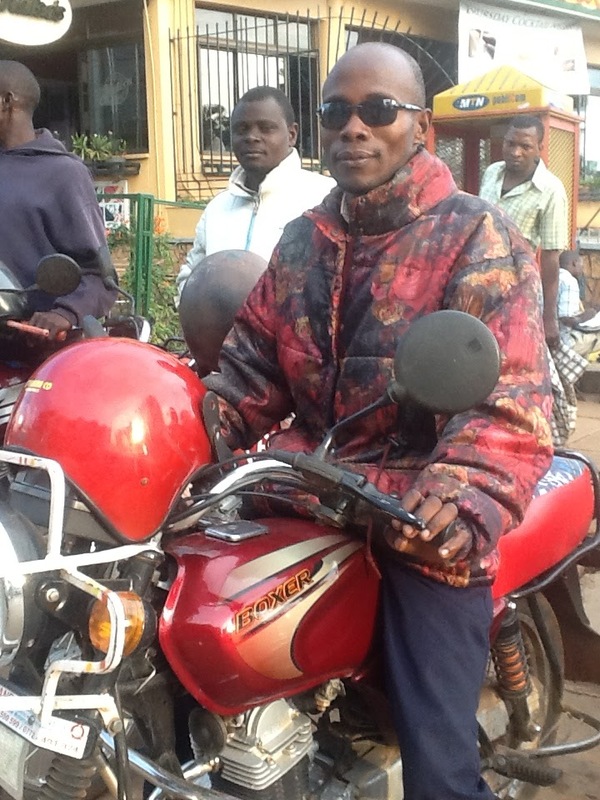 Puffy ski jackets with high collars are all the rage for boda drivers at the moment. 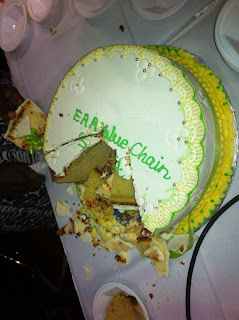 The cake made from matooke (banana plantain) at the conference was yummy.